Parliament House Since Nay Pyi Taw is the capital of the country, it houses the Parliament House. The impressive parliament building covers an 800-acre campus. It contains 31 structures including the President’s residence and is located in the Zebuthiri township approachable through a 20-lane highway. The building features Myanmarese architecture where the interiors reflect local culture and traditions. City Hall Nay Pyi Taw City Hall is the headquarters of Nay Pyi Taw Development Committee and is a landmark building of the city. During important state occasions, the National Anthem of Myanmar is played by the State Orchestra in the City Hall. The City Hall has exhibits beautiful architecture with a Myanmar style decorated roof. There is a park with a playground and water fountain behind the hall. MICC A notable landmark of the city is the two buildings of Myanmar International Convention Centre (MICC). A number of large-scale international events have been hosted here including the World Economic Forum East Asia and the ASEAN Tourism Forum. MICC I has 2 main halls, 33 function rooms and 40 supporting rooms spread over 6000 square metres of space. It was inaugurated in 2014. MICC II, inaugurated in 2010. Gems Museum Tourists looking forward to exploring the local culture can visit the 3-stories Gems Museum flanked by two white elephant sculptures. The museum features a 69 kg jade boulder and Myanmar’s largest ruby weighing 21,450carats. Myanmar is well-known for its precious stones which are rightly depicted through the displays at the Gems Museum. The Museum also displays an enormous natural pearl. The venue of the national gems emporium. The National Museum is located on a 14-hectare plot near the Kumudra circle in Ottarathiri township. It is spread over five buildings – A, B, C, D and E. Building A houses a mini theatre, VIP holding rooms, President’s Gift Exhibition Room and a Public Area. The rest of the buildings have display areas for different items. The display area in building B is divided into different exhibition rooms. Defence Services Museum Nay Pyi Taw houses an impressive defence services museum, a grand collonaded collection of buildings spread over a 604-acre site. The building enjoys a spectacular view of the countryside, located at the backdrop of Shan Hills. The museum has opened to enable people to learn about the independence struggles, historic battles and actions of armed forces since its birth in 1945. The museum has 6 booths of Armed Forces. The National Landmark Garden is a miniature model of the states and regions of Myanmar, situated on a 400-acre plot near Thaik chaung Village in Zeyathiri Township. The garden showcases scaled-down versions of the country’s most famous attractions, such as the Shwedagon Pagoda in Yangon, Ngapali Beach in Rakhine State and Inlay Lake in Shan State. It is a great place to visit to learn Myanmar national races’. Planetarium Tourists interested in astronomy can visit the Planetarium. It provides a wealth of knowledge about the solar system and the wonders of the universe. Visitors can view the exhibits of planets, the moon, the earth and other wonders of the universe. There are a number of audiovisual displays. The planetarium is open daily from 10 am to 4 pm, except Mondays. Royal Myanmar Golf Course Nay Pyi Taw is home to the Royal Myanmar Golf Course which is an 18 hole well-maintained golf course. It is shaped to accentuate the terrain and is characterised by designs in between which highlight the sites natural attributes. It also has a City Golf Pro Shop for full services including rentals sets for playing. Uppatasanti Pagoda is a renowned landmark of Nay Pyi Taw city. The pagoda stands 100 m high, is an almost exact replica of Shwedagon Pagoda of Yangon and houses a Buddha tooth relic from China. At the pagoda, Buddha’s path to the achievement of Nirvana is depicted through majestic statues. It also features a Maha Hsutaungpyae Buddha image, four jade Buddha images in the hollow cave. White Elephant House Tourists interested to view some exotic wild animals can head to the White Elephant House. At the foot of the Uppatasanti Pagoda, there is a park home to several white elephants in Nay Pyi Taw. The people of Myanmar believe bring with them Luck, peace and prosperity to their life. The elephant house has been built in the traditional Myanmar architectural style and features grassland and viewing areas. Thatta Thattamaha Bawdi Pagoda This 162 feet high pagoda is a replica of Buddha Gaya of India, where Buddha attained enlightenment. It was built on the Udayayanthi Hill lock in Pohbbathiri Township. 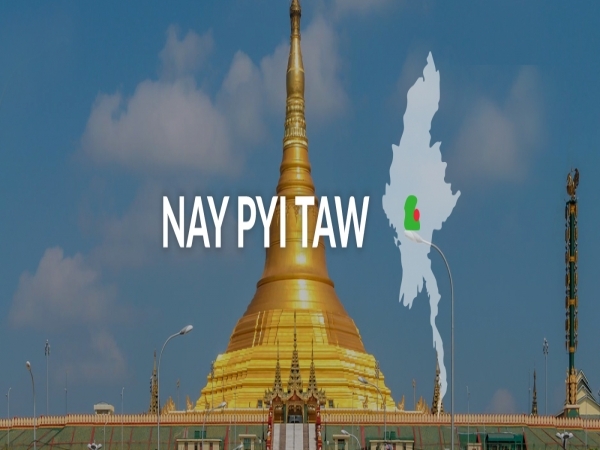 it is only about a 10 to 20 minutes drive from Nay Pyi Taw and is a great place to visit.